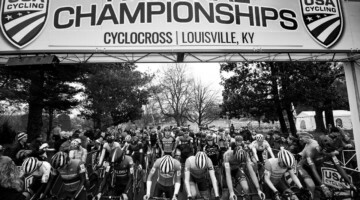 LOUISVILLE, KENTUCKY — The final race of the 2012 Masters Cyclocross World Championships might have had the most challenging conditions of the weekend. The frozen ground had continued to melt throughout the day, and riders were greeted with thick peanut butter mud and ultra slippery corners. Shannon Gibson (USA) worked to quickly establish a gap and put her technical skills to work. 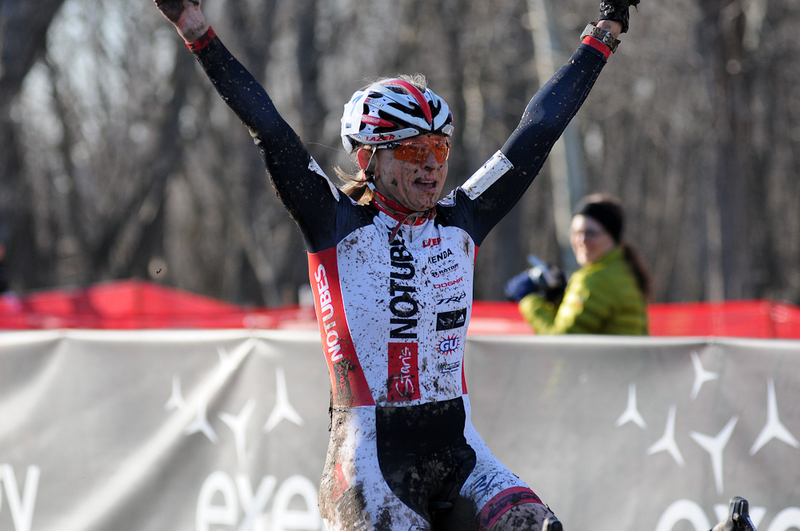 She was followed by Lori Cooke (USA) and Jennifer Maxwell (USA). Antonia Leal (USA) rode in fourth, and was making up ground quickly. Once Gibson had established a large gap, she looked to be on cruise control and continued to ride smooth and choose the best lines. Behind her, Cooke was being chased hard by Leal. With 1 lap to go, Gibson had put even more time between herself and her chasers, and now had a 40 second buffer. Leal made contact with Cooke, and the fight for the silver medal seemed like it was going to come down to a sprint. 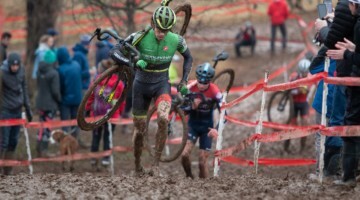 That sprint never materialized, as Leal had mechanical issues and dropped back to fourth opening the door for the final place on the podium, which now looked to be Jennifer Maxwell’s. 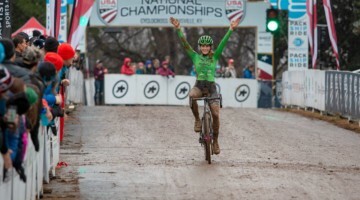 Gibson rode her last half lap smoothly and raced her way into the history books and a rainbow jersey. Cooke held on for second, and Maxwell was ecstatic with third. Leal seemed dejected, but still managed a small smile for the finish line photographers. 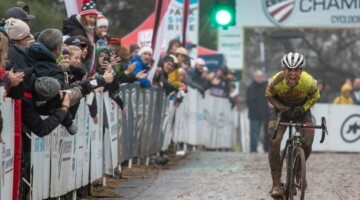 Shannon Gibson had closed out the 2012 Master’s World Championships with a very deserving victory. 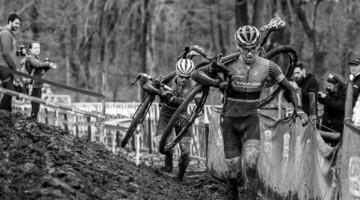 DNF 8 BAUMSTEIGER Katrina (TrinTae)am Rambuski Law USA . .
DNF 20 CASALS Julia Van Dessel Factory Team Pb Sterke MeideUnSA . .
DNS 9 ANGELES Robyn Independent CAN . DNS 15 SHAW Susan Fusion It USA . @showerspass @olybuzz just got his replacement jacket just in time for running around in the snow in #olympia! Thanks!